by Davis, Kenneth C., Schindler, S. D.
Davis, Kenneth C., Schindler, S. D.
Thirty-four children on the "Mayflower" Three days of Thanksgiving feasting And hundreds of facts about the hardworking Pilgrims Pilgrims in Plymouth: True or False Quiz The "Mayflower" was a huge shipnearly as large as the "Titanic"with a bowling alley and a swimming pool! Squanto, an Indian who helped the Pilgrims, spoke English. Pilgrim farmers buried fish in the ground to help their corn grow better. The Pilgrims called their harvest feast Thanksgiving. Thanksgiving today is a time for families to say grace and gobble turkey. But why did the Pilgrims start this tradition? And who were these people anyway? 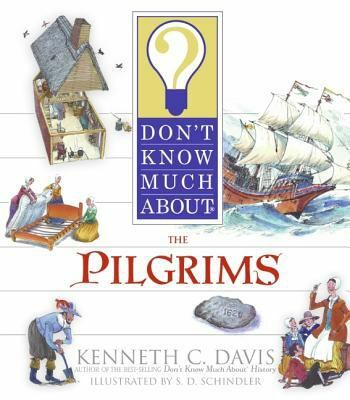 In this latest outstanding entry in the Don't Know Much About(R) series by renowned author Kenneth C. Davis, you can discover all you ever wanted to know about the Pilgrims.Davis, Kenneth C. is the author of 'Don't Know Much about the Pilgrims' with ISBN 9780064462280 and ISBN 0064462285. Loading marketplace prices 123 copies from $0.01 How does the rental process work?